Article by Vimala Narasimhan, Sai World Student Reporter, attends and leads bhajans at the SSBC's of Encinitas and San Diego, California. She is 13 years old. Imagine…..Just let your imagination run free for a moment. Imagine you are in Whitefield preparing for a play that will be presented to the Lord of the Universe. Your palms begin to sweat profusely as you approach the stage. The hours upon hours of practice that you put into the play seem to fade away and you simply live in the moment, forgetting everything else except the stage and the Lord watching you. For 50 children from Texas, this was something that they did not have to imagine, since they were given the chance to experience this joyous bliss first hand. I was fortunate to have the opportunity to interview a young lady who had just come back from Whitefield with some very insightful experiences. I interviewed Devi Natarajan, a Young Adult from the Sathya Sai Center of Dallas. Though Devi had not taken part in the play herself, she was in Whitefield with the children who had taken part and had firsthand accounts of the entire program. 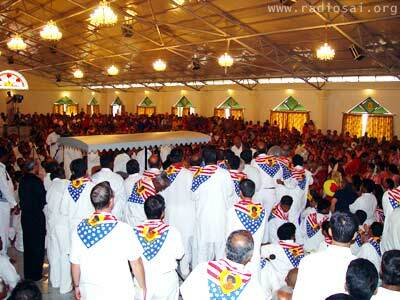 Devi said that the entire center had been deeply involved in seva right from the start of their trip. Their typical day consisted of waking up and going to nagarsankeerthan, then going to the hall for Darshan and meditation afterwards. Once they were done with that, they went for seva till lunchtime. The members of the center were given a chance to do bathroom clean up, make goody bags, clean up trash, help in the canteen, and do several other forms of seva, which was a great opportunity to serve the Lord at His abode. After lunchtime, Swami would send two speakers to talk to the congregation, and when the speakers were finished, the group went back to do more seva. Once they were done with seva, the youth would go off to practice bhajans while the rest of the children and adults would go to practice for the play. Finally, they would all meet at dinner and then everyone was free to do whatever they liked. Devi also gave me a very detailed explanation of the exciting preparation that went on for the play. 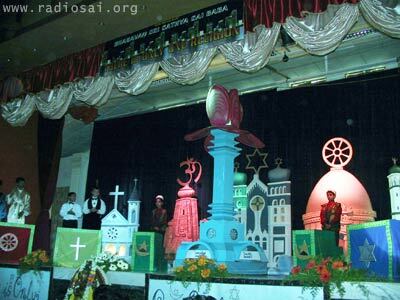 Swami had said that the play would be performed on Thursday and the children immediately set to work practicing harder than ever. They were now given the chance to practice in the shed behind the hall, as opposed to the small room that they were using. When the day of the performance came, everyone was taken by surprise since Swami wanted them to perform in the morning! The Young Adults were also given a chance to sing two songs as Swami came out in a golf cart, his first Darshan after about 25 days. Two boys from the center then came up to Swami and asked him to bless the program, which He gladly did. One of the boys apparently reported seeing a bright light when he was blessed. Swami sat through the entire program and constantly asked one of the center members who was the best actor, all the while knowing which one was best!! After the program, the children came down from the stage and Swami created vibhuti and blew it on them. He also materialised a necklace to a girl who was about 5 years old and commented that she had been in Parthi on her 3rd birthday, a fact that surprised almost everyone in the hall. 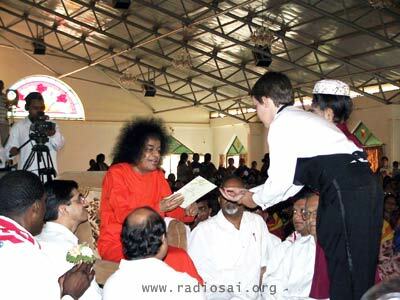 Another boy asked Swami if he could study at Swami's school, but Swami simply told him that it was not the time for him to study at the school. So, the boy asked if he could study medicine, to which Swami replied "Yes." Once the excitement of the play was over, all of the centers from the region got together to share their experiences. Suddenly, a man came over to deliver a card to one of the actresses. The card said "My love and blessings to all," which really was a message for all of the centers. I was so caught up with the excitement while interviewing Devi. I could just imagine the thrill the kids must have felt when Swami was standing so close to them! Devi closed the interview with a sigh and said that while the trip and the excitement had come to a close, not one person from those centers would ever forget the thrilling feeling of presenting a play in front of Swami and the few magical weeks they spent in the abode of the Lord of the Universe.